As the audience shuffle into the studio theatre, a teenage girl sits hunched at a table, a pair of headphones clamped to her head, scribbling on a notepad. Her name, she announces, is Vera Elizabeth Shrimp, and she is the protagonist of Rosie & Me's superb new show about an ordinary young girl with an extraordinary talent. Directed by Rosie Kellagher, The Soaking of Vera Shrimp begins as a science presentation, with Vera as both the presenter and the subject. During a sudden downpour, four weeks after the death of her mother, Vera finds she has developed the supernatural ability to 'read' rain: the moment a droplet strikes her skin, she experiences a burst of emotion soaked up by the water from its previous contact with another person. It's a fantastical premise that writer Alison Carr keeps grounded with a considerable emotional weight, using Vera's unique ability to explore deeper themes of love and loss. 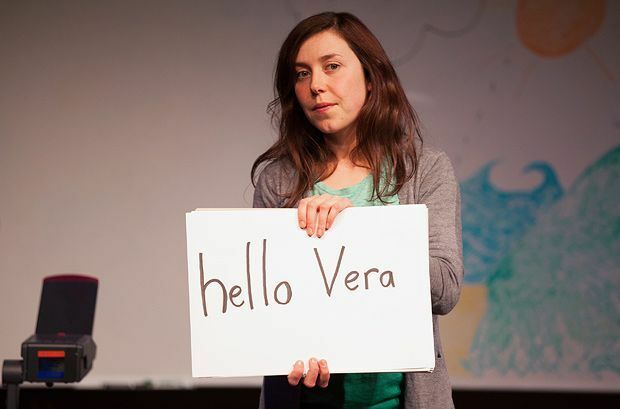 In one heartbreaking sequence, Vera uses cue cards to cast the audience as her grieving father. It's a devastatingly effective theatrical device that pulls the audience directly into Vera's story. But the highlight of the show is Tessa Parr's captivatingly quirky central performance. An astonishingly capable performer, Parr inhabits her role as 14-year-old Vera, and her effervescent enthusiasm and childlike speech patterns both brighten the play's comic moments and imbue its emotional depths with an extra pathos. In their Fringe debut, Rosie & Me combine an intelligent script, an original premise, and an infinitely charismatic protagonist into a sparkling solo show. The Soaking of Vera Shrimp is an utter delight. Pleasance Courtyard, 556 6550, until 31 Aug, 12.45pm, £7.50–£9.50 (£6.50–£8.50).